The cosmological simulations performed at the CAST group follow the evolution of single halos in a periodic box with a side length of 100 Mpc. We began with a dark matter only simulation of homogeneous resolution to create a catalog of halos for our box. In this simulation we identify all the particles that will make up a halo at redshift z=0 and create new initial conditions where those particles are replaced with dark matter and gas particles at higher resolution. The rest of the box is still included but at lower resolution since we need the long range tidal forces to correctly follow the galaxy evolution. The evolution of this halo is computed using the TreeSPH code GADGET-2 written by Volker Springel and includes radiative cooling for a primordial distribution of hydrogen and helium as well as a redshift dependent spatially uniform UV-background radiation field. The cool gas can form stars once its density rises above a certain threshold value, these stars will eventually reheat the ISM via supernovae feedback. 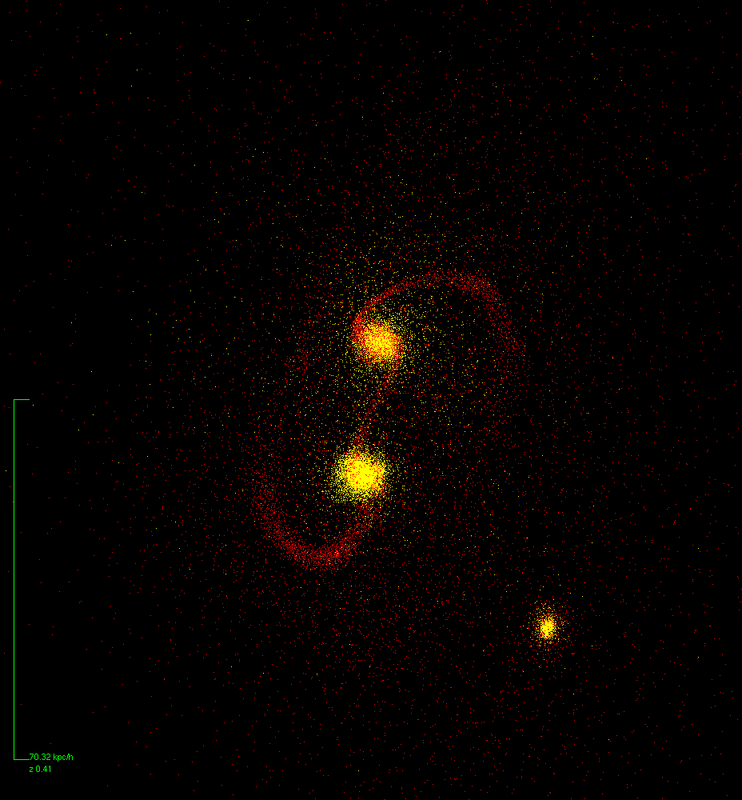 This picture shows halo #6782 at a redshift of z=0.41 just after the first passage of the two main progenitors for this halo. (Click on the picture for a movie of the complete evolution of this galaxy, 65 MB). The gas particles are shown as red points and stars are yellow. The mass and spatial resolution of this simulation are 5.3e5 Msun and 200 Kpc/h, respectively. These simulations allow us to follow the evolution of galaxies in a cosmological context. We are examining the properties of elliptical galaxies such as scaling relations (R. Jesseit in prep.) and the two modes of accretion for galaxies (L.Oser in prep. ).